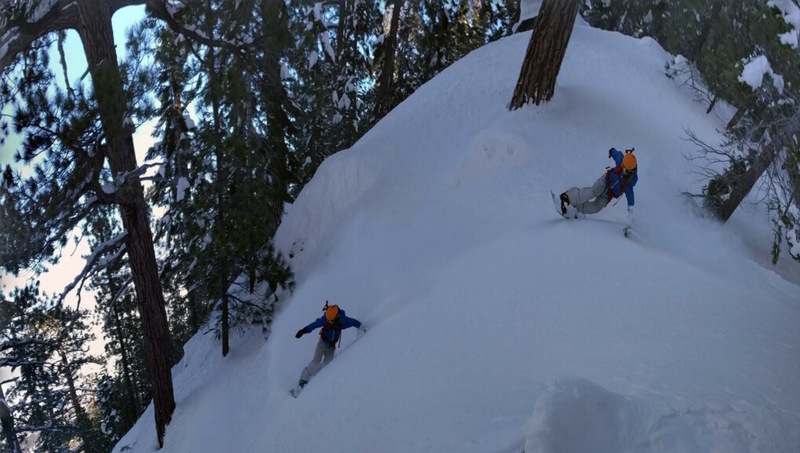 We've had a few small-to-moderate storms, for Sierra standards, over the past week that have led to continued fantastic snow sliding conditions. I don't need to tell you this, but the snow is getting deep. Here are a couple of shots from Alpine Meadows on last Friday, 2/17. The next storm system is already beginning to impact the Sierra, and it will be another doozy. 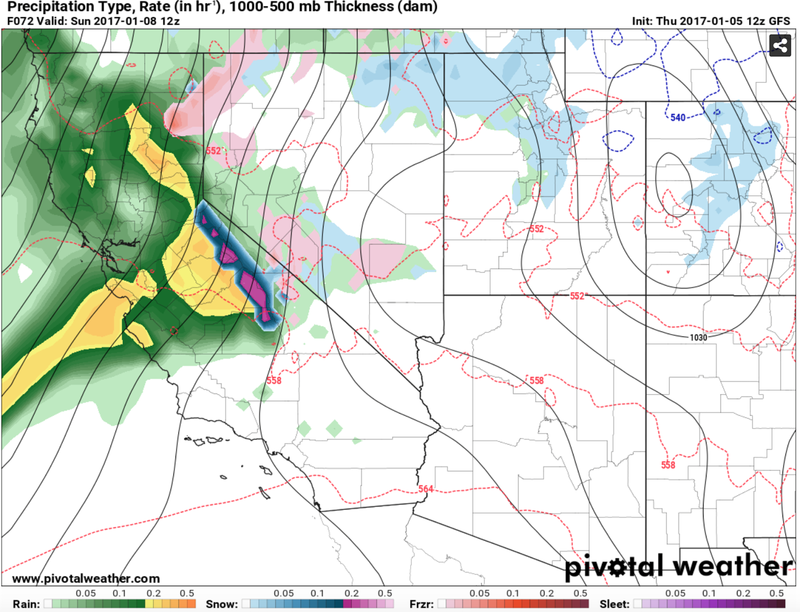 A strong jet, 150-170 knots at the core, will direct heavy precipitation and dangerous winds into the Sierra for several days...again. Figure: 250mb winds (jet stream level) showing a powerful jet aimed at the northern Sierra. Forecast shown is for Sunday morning through Tuesday afternoon. 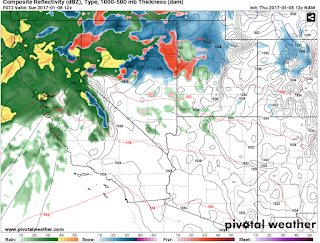 Heavy precipitation is all but guaranteed, but once again the snow levels will be the deciding factor in snow accumulations below about 7000 feet. Figure: Total precipitation from GFS through early Thursday morning. 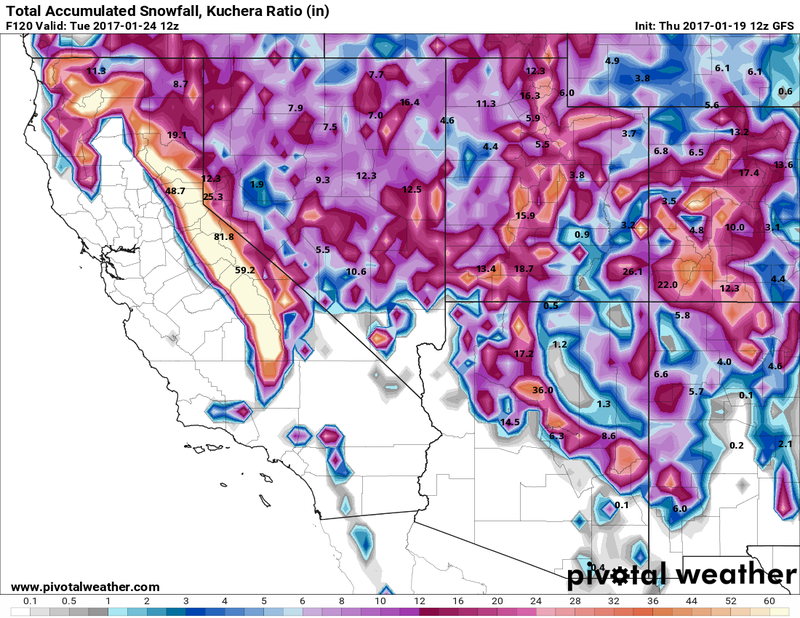 There is a 6-10 inch bullseye over Tahoe and northern Sierra. 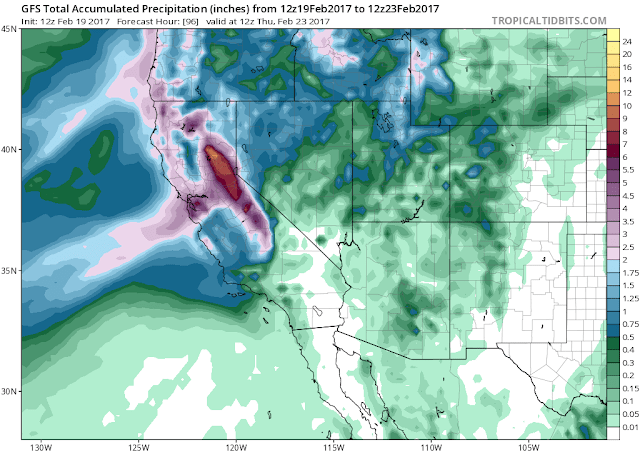 Not good for the Oroville dam flooding concerns. 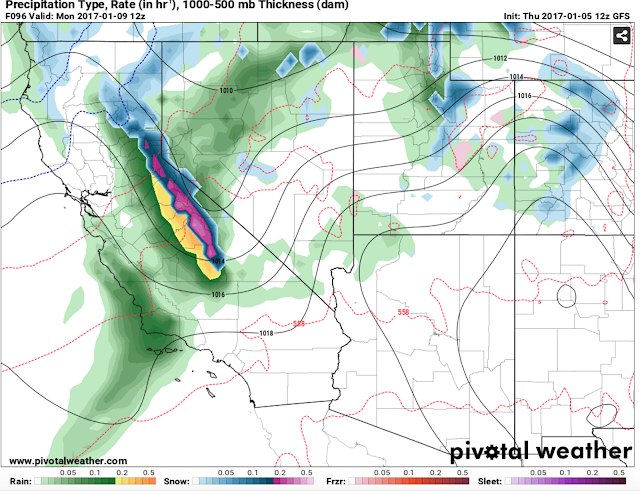 The storm will start cold enough for all snow in Tahoe, then some warm air creeps in, and then back to all snow during the end of the event. 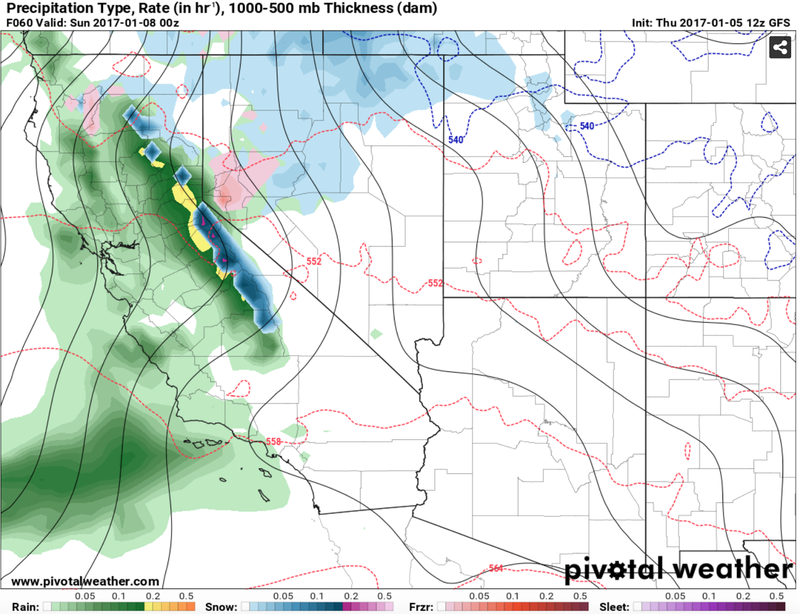 Snow levels could get up above 7500 feet for a short period, but heavy precipitation rates might allow for lower snow levels. Figure: 700 mb (~10,000 feet) forecast Sunday morning through Tuesday afternoon from the NAM. The green shading (with red line) shows the 0 degree, or approximate freezing line. 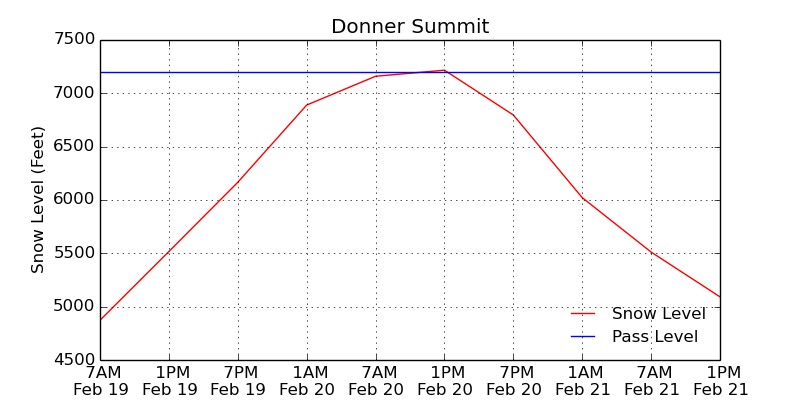 Forecast from the National Weather Service shows snow levels rising above Donner pass for a few hours on Monday. Figure: Snow level forecast from the National Weather Service, Reno office. By the end of the storm expect 4-6 FEET of snow above 7500 feet with several feet likely between 6500 and 7500 feet. Lake level snow will be tricky and depend how much (and fast) snow levels rise. Flooding, avalanches, and mudslides will once again all be a concern. Monday will likely be a don't go out there kind of day. We will likely see several more small storms Wednesday through Friday that will be colder bringing a nice fresh coating on top of the massive pineapple pow that is on the way. Winter continues to provide for the Sierra as three more storms will impact the region over the next week. The first two storms are back to back beginning this evening with a slight break late tomorrow before picking up again into Wednesday. 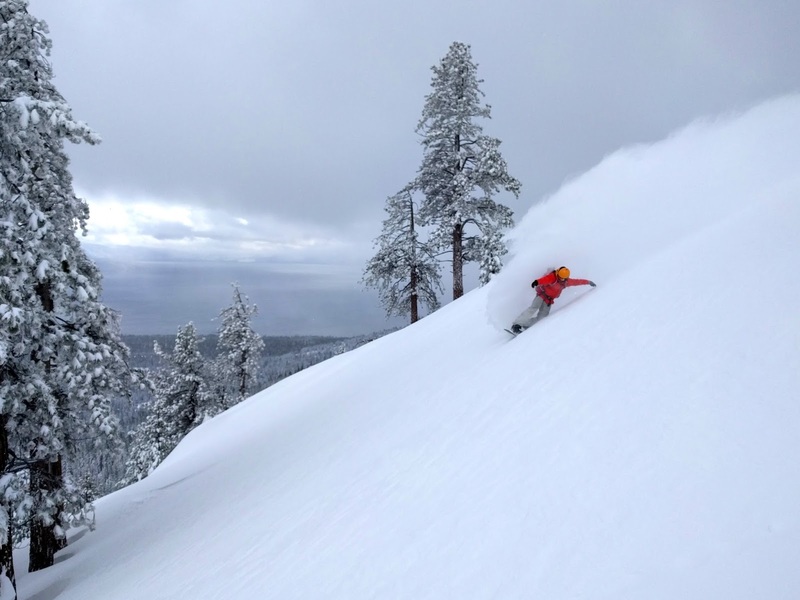 The second storm won't be as cold and will have a better moisture connection, which means snow levels will be a problem for powder hounds. 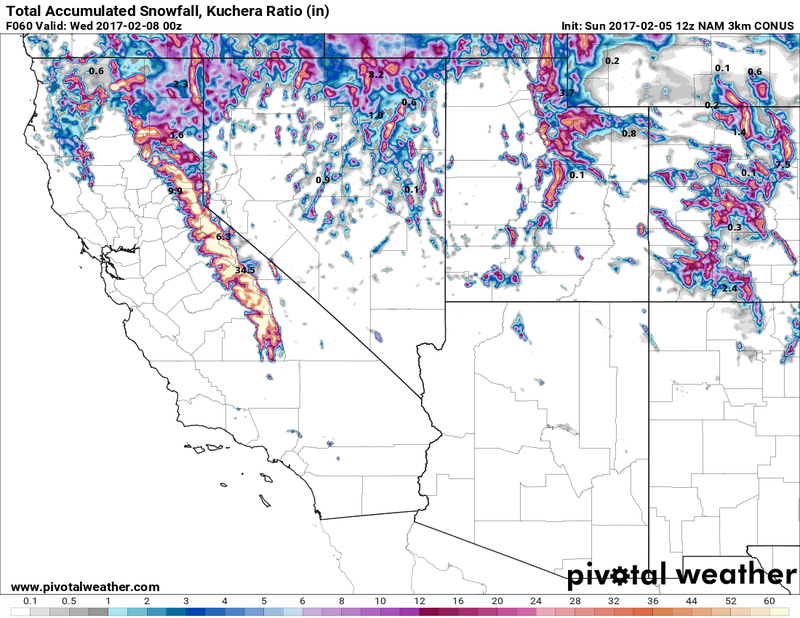 However, most of the models are in good agreement that 2'+ of new snow will fall across the mid to high elevations of the Sierra by Wednesday morning. These look like great snow totals, but there will be some rain on snow especially mid-mountain elevations and below on Tuesday into Wednesday. 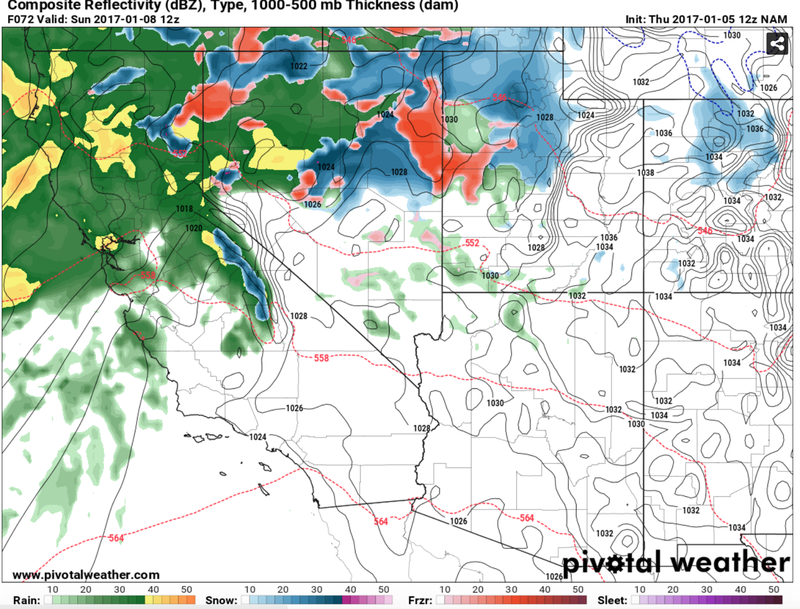 This means the snow that falls late Monday into Wednesday will be wetter and warmer aka Sierra Cement due to the strong moisture connection from the Pacific (below) and the lack of a strong, deep trough accompanying it. 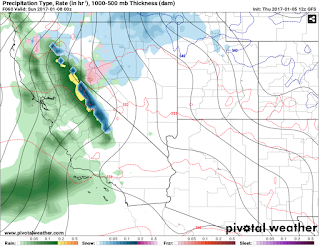 This might suppress overall snow totals and also increase avalanche concerns through the week. There is another storm forecast for Thursday into Friday, which looks to be colder than the middle storm, but it's a bit premature to start forecasting snow amounts and timing right now (although it looks good!). The good news is the record setting and epic current winter continues, so go out and enjoy it this week! This was Januburied (below). 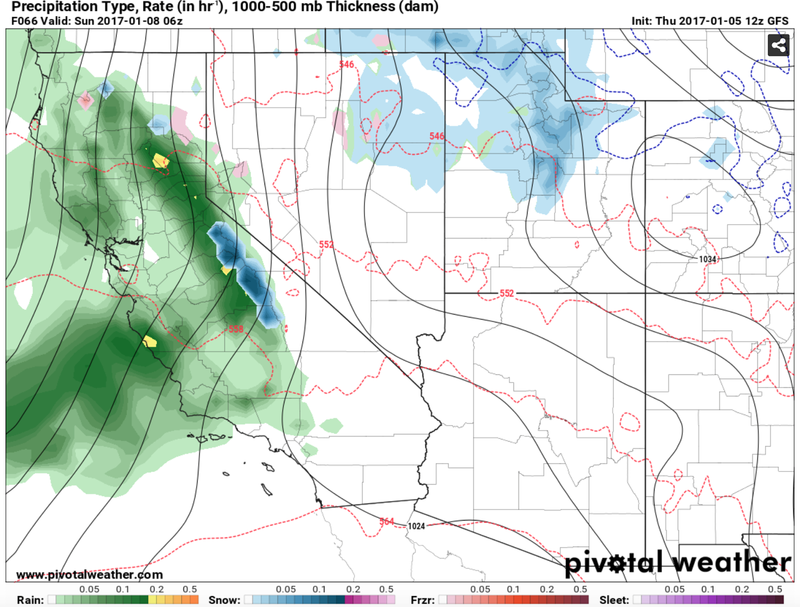 If you are coming from TGR, welcome to our little forecast site for the Sierra Nevada, and if you have been following us for the past five years, thanks for your support! The figure above (and again a bit below to avoid you scrolling constantly) demonstrates how it all happened. In short, multiple landfalling atmospheric rivers (ARs) brought substantial precipitation to the Sierra Nevada throughout much of January. 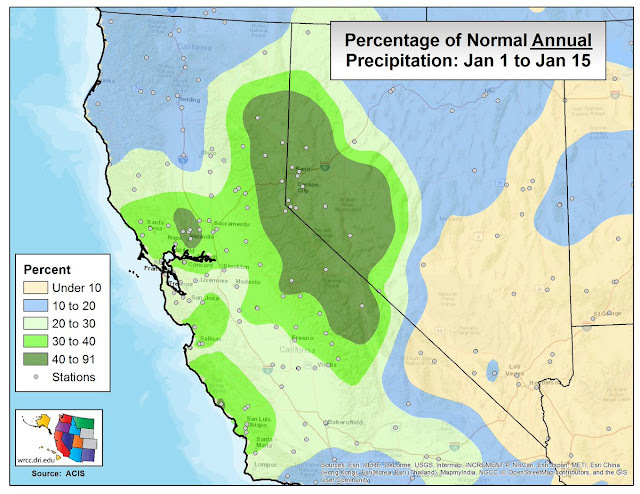 There were some scary times for the snowpack and regarding flooding on either side of the Sierra (notably January 7-8 and the time leading up to that event when we knew we were in for a big one but the outcome was uncertain). The one-two punch of a colder storm (AR #1) followed by a warmer AR #2 (note high snow levels around 8500-9500 ft) is a 3 Michelin Star recipe for rain-on-snow induced flooding. Following these storms, we got extremely lucky with the consistently cooler temperatures and lower snow levels that produced copious snowfall and low elevations during ARs #3-5. Let's break this down a bit. 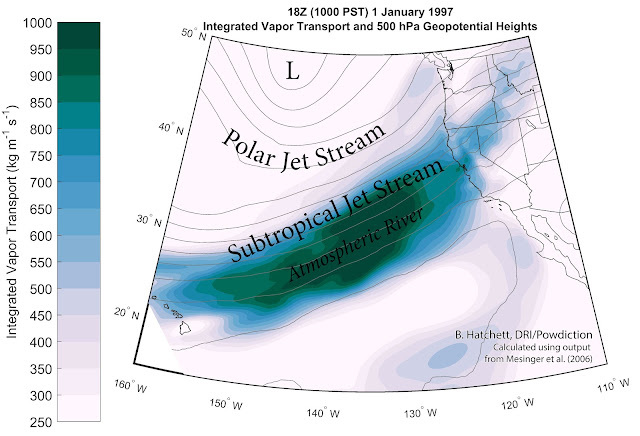 An excellent metric that has been developed to identify atmospheric rivers, which are long (2000 km), narrow (typically less than 1000 km), corridors of enhanced precipitable water (blue dots; pwater or pdub for you hip hop fans) and water vapor transport (wind times precipitable water). They (ARs) exist in the warm sector of cyclones, hence their often high snow levels. Note how the black dots below tend to be higher during AR conditions (green boxes, when observed pwater exceeds 20 mm along the California Coast). ARs are a form of a low level jet (strong winds), which when these strong winds slam into terrain, produce incredible precipitation totals over multi-day periods. In fact, California sees some of the largest 3-day total precipitation magnitudes in the United States, on par with hurricane precipitation totals in the southeastern U.S. The narrow plumes of high precipitable water are known as atmospheric rivers. This view from the SSM/I instrument shows AR#2 and #3 making landfall. The start of Januburied was produced by the persistent counterclockwise circulation in the northeastern Pacific (low pressure) that favored continuous atmospheric river landfalls. 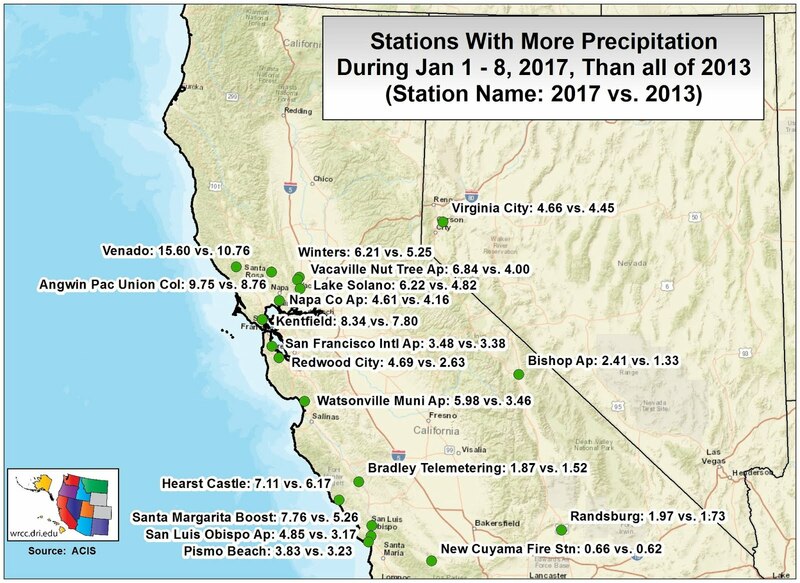 In California, we receive nearly 50% of our annual precipitation from these types of storms and they contribute to nearly all of the variability of our precipitation. In other words, a handful of these, or lack thereof, make the difference between an awesome wet year and a crappy drought year. 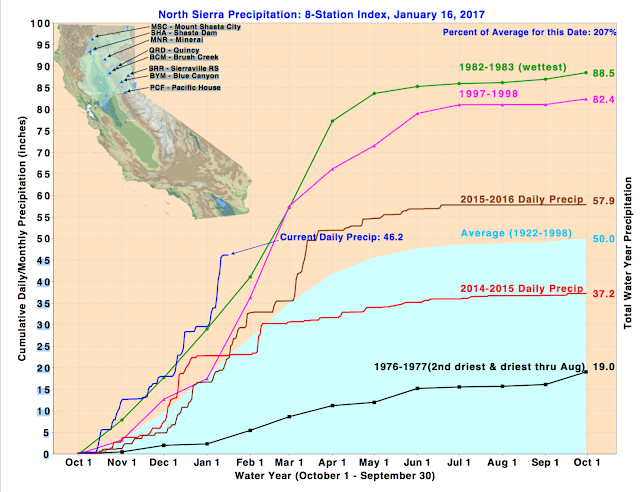 Next, note how significant precipitation (blue bars) was observed during these events along the western slope of the Sierra (Blue Canyon, one of the wetter spots in the northern central Sierra Nevada). The peaks and valleys of the precipitation (bars) line up beautifully with the peaks in pwater (blue dots). 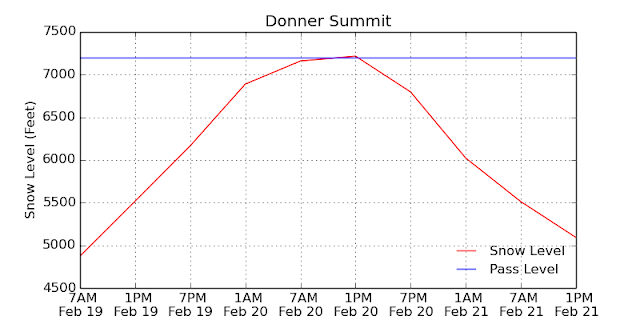 The grey line shows daily Donner Summit snow depth (all other data is hourly) at en elevation of approximately 6900 ft (the Central Sierra Snow Lab for those of you familiar with SNOTEL or the Summit itself). During all ARs, with the exception of AR #2, substantial increases in snow depth occurred, particularly during the AR #3 (the official start of Januburied?). The slow decline in snow depth during non-precipitating conditions is likely due to settling of snow. Had I plotted snow water equivalent, or the amount of water stored in the snowpack, the line would just launch upwards in all cases. This concept is where we got lucky again (at least I think so). 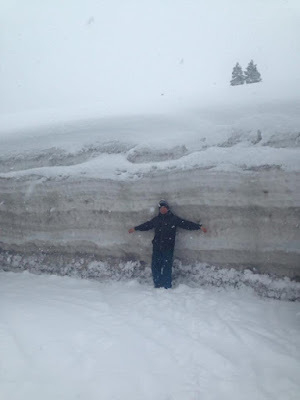 AR #1, though somewhat of an upside down storm (snow levels rose through the first part, leading to more dense snow being deposited atop less dense snow), gave us a nice snowy sponge to absorb much of the rainfall that came during the flood event (AR #2). This massively boosted the water stored in the snowpack (very good for water resources and the destruction of certain sneaky persistent weak layers). Had we not had this pre-storm boost, who knows what the outcome may have been! To make things even more awesome, when it wasn't snowing, it was cold and/or cloudy (sorry, I could have plotted solar radiation but I got lazy at the end), and we avoided the wicked wind of the east, with a six hour exception. This favored extremely good snow conditions from summits to the lowest elevations, and created much rejoicing and probably got more than a few people (myself included) a bit behind in work. Dr. Hatchett researching snow transport. 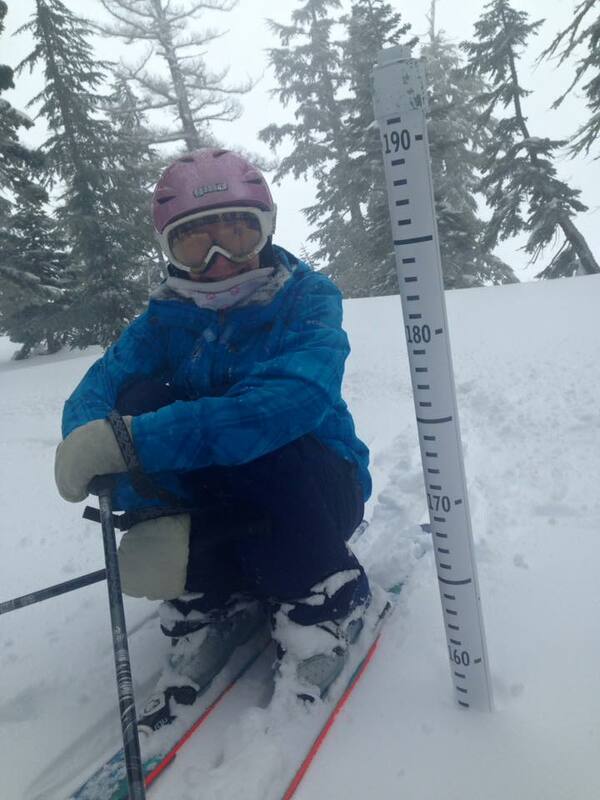 Dr. Morales engages in some intradisciplinary snow science studies. 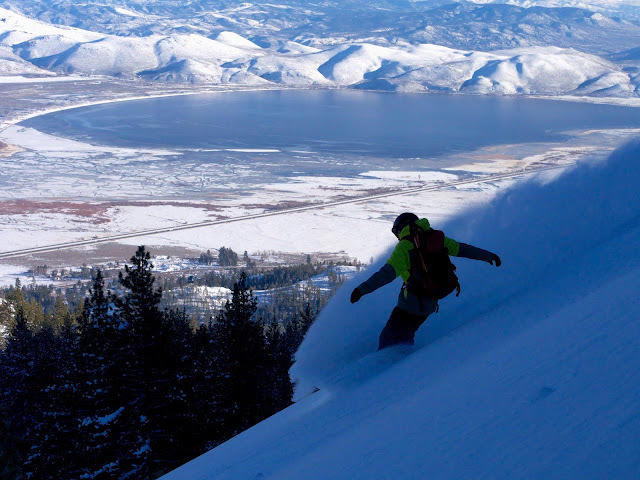 One of the best bonuses of atmospheric rivers and spillover precipitation are that they help fill up desert terminal lakes such as Washoe Lake in the background. These lakes are natural rain gauges and make for cool photographs. The data used in the Januburied figure is publicly available and was acquired from NOAA, UCAR, CDEC, and XMACIS. Always good to some fieldwork! Why don't you kids get some Jobs! Whoa! Still brrrrrrr kinda snow in the Carson Range trees above the gated community. Above are the forecast snowfall maps from the GFS (top) and NAM 3km (bottom) operational models through Monday night. The GFS has a lower resolution so the snow totals are usually more smoothed, which explains some of the differences between the two maps. 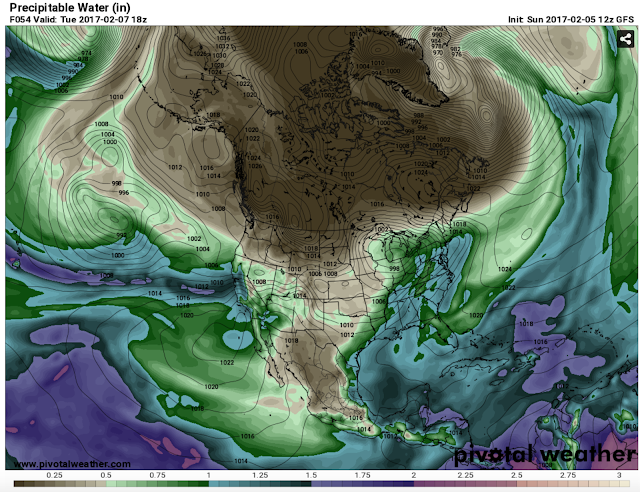 Below is a loop of precipitable water and surface pressure illustrating the wave train impacting the Sierra. We had one wave move through and looks like two more are lined up. The record setting winter continues and it's definitely a welcomed sight after a brutal stretch from 2011-2015. Also it's been beautiful to see all the snow across the Western US after flying over the region during the last two days. So continue to enjoy the cold smoke in the white room! Going to go through some of the record set with our impressive January and overall start to the water year (October 1 - September 30). 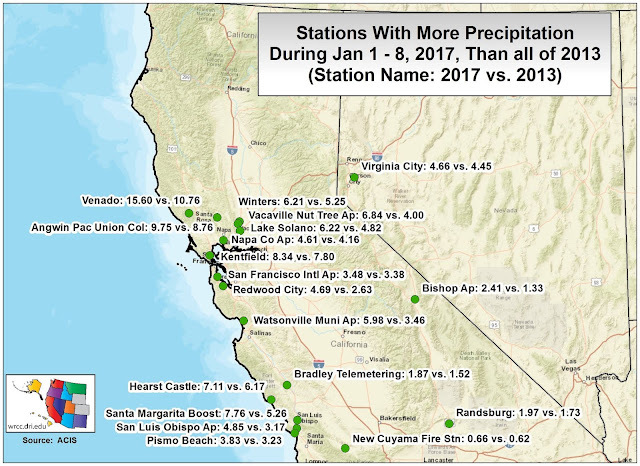 The first two images show the massive amounts of precipitation that have fallen over central and northern California in January. They also highlight how dry it has been recently. Thanks to our friends at the WRCC for creating these plots. Some areas received more rain in one week than all of 2013 (top image)!!!!!! Also there are some large swaths of areas that have already seen 40%+ of annual precipitation in the first 15 days of the calendar year!!!! These are insane stats. South Lake Tahoe also had their wettest 5, 10, 15 days all in the first 15 days of January. When looking at the total water year, we are well above the wettest year on record (green line 1982-83). And look at the slope of the line since 1 January!!! We are nearly at the annual average and have already eclipsed 2014-15 precipitation totals. Now, let's discuss the snow because let's be honest, that's what we care about the most. 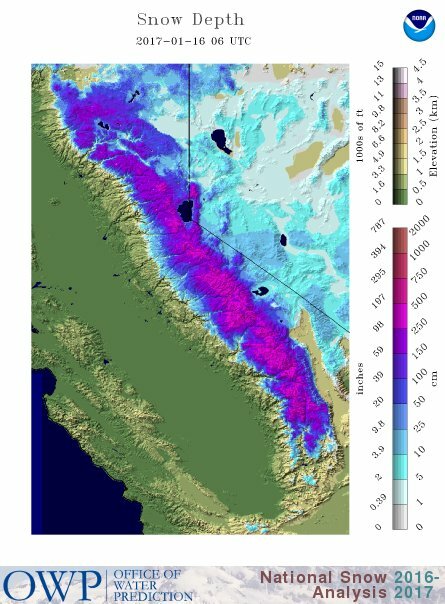 We are nearly 200% of normal for snow water equivalent and most of the higher elevations of the Sierra have 100-200" of snow on the ground right now. 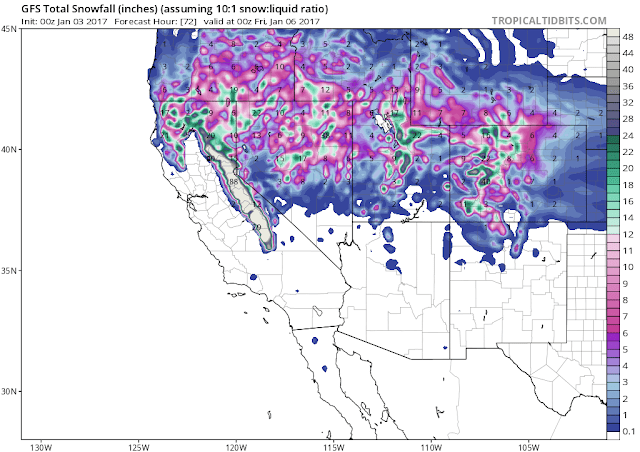 As you can see there is plenty of snow to play with in the Sierra and really across most of the western US. It's been awhile since we've had a big season (2010-11), and it seems longer due to the length and severity of the drought in the Sierra since that big season. And more good news is on the horizon. More snow is in the forecast for this week/weekend and the long range model guidance shows another wave train setting up in the Pacific. So take a minute to soak in all this good fortune and then go shred! Throwback to 1997? Or just 2005? The 2016-2017 season has been pretty wild to start, with an extremely wet October up high, a dry November, and a somewhat classic December (mix of wet/cold/warmer but not too dry thankfully!). Then January comes along, keeps the light and dry pow coming for a few days, but follows it up with a potentially devastating round of very strong atmospheric rivers and high snow levels. Depending on how the snow levels work out, ski season could be in deep doodoo for the lower elevations and off the hook up high (high snow level scenario) or world class all around (lower snow level scenario). The last two proper flood events are similar to the forecast event in time of year and general setup. They were both right around New Years and preceded by colder storms, which setup an excellent scenario for rain-on-snow flooding. This year we could see even more productive flooding due to the certainly saturated state of soils (the end of 1996 had some good rain events as well, but I can't recall 2005). The ultimate flood events include a coupling of the polar jet, subtropical jet, and the narrow, elongated plume of concentrated low to midlevel water vapor flux (atmospheric river). Shown below is the moisture transport and 500 hPa height field from the gold standard flood event in 1997. The moisture source originates near Hawaii, leading to the Pineapple Express term, whereas when the moisture plume originates further westward it is sometimes called the Mango Connection. Get ready for a repeat! Below is the 72 hour integrated IVT. 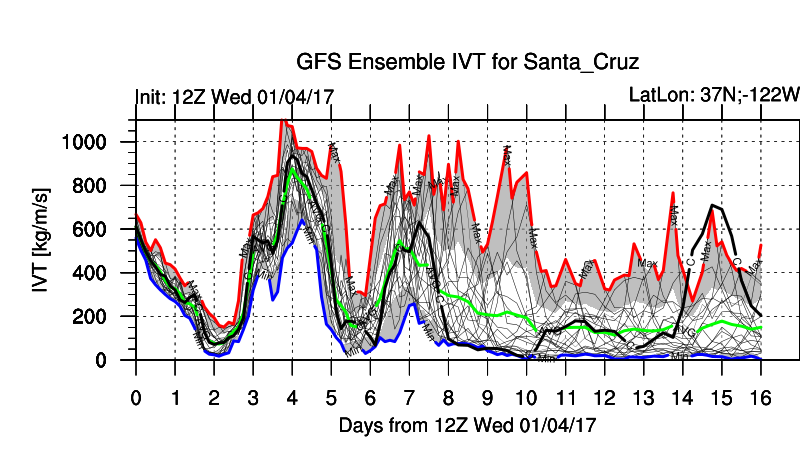 The GFS Ensemble IVT forecast shows the Friday break and the weekend demolition derby of moisture flux. These values have come down a bit in recent forecasts, yesterday they were off the charts. Atmospheric river (AR) thresholds start at 250 kg/m/s (but are rightfully arguable as a function of latitude, just talk to some Arctic/Antarctic meteorologists) and strong ARs are typically in the 400-700 kg/m/s range. The weekend event will be memorable. The pan-Pacific upper level atmospheric patterns conducive to the most extreme storms are well-known and characterized by a blocking high near the dateline that is undercut by a strong zonal jet (see figure below from Underwood et al. 2009 J. Hydrometeor.). Contours are 250 hPa heights, filled contours are 250 hPa winds. Looks a lot like what is forecast for Saturday! 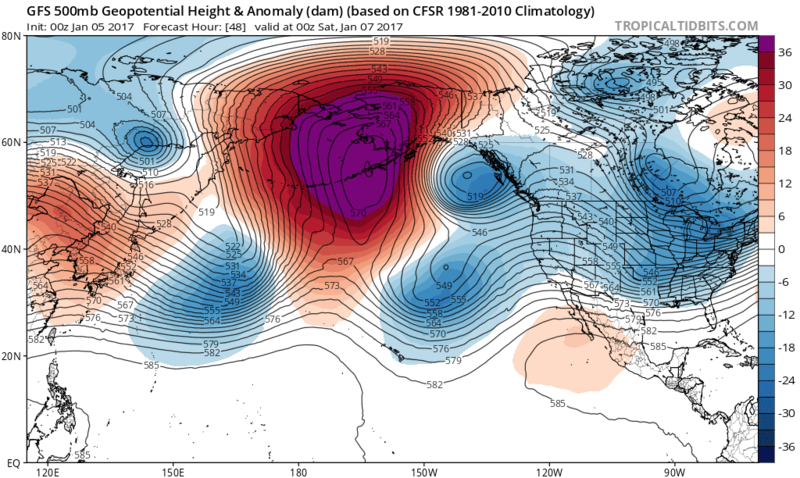 The same signal appears in a composite of 500 hPa heights and water vapor transport anomalies I made for days characterized by upside down storms and high avalanche hazard in the northern Sierra (Hatchett et al. in prep). 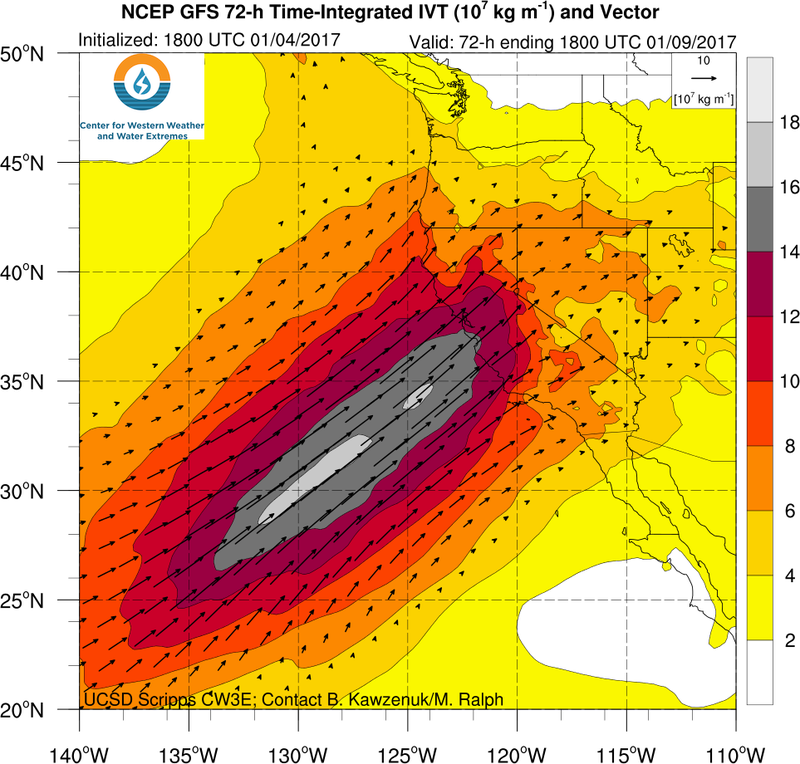 The thick black lines show positive height anomalies (ridging) developing near the dateline, and as one gets closer to the day of the event, the anomalous trough develops offshore of California with strong vapor transport favoring copious precipitation (panel d, star shows the Tahoe Basin). Right now, we are looking like panel c, about three days out (see above GFS forecast). UDSE means 'upside down storm event', or layering of more dense snow upon less dense snow. As Donald Trump would end his tweet on this: "Excellent for avalanches! Nice!" Figure from Hatchett et al. in prep. The forecast for precipitation is outrageously high and not worth showing. It will precipitate jaguars and wolves like a good old hurricane of the west (see Ralph and Dettinger 2012 Bull. Amer. Meteor. Soc.). The biggest question for hydrology and snow enthusiasts is WHERE IN THE WORLD WILL SNOW LEVELS BE? First order of business is 700 hPa temperatures, even though there are a multitude of physical processes that control the snow level. Before we look at 700 hPa temperatures, here's a diagram I made highlighting just a few of the snow level/precipitation processes that are occurring at a range of scales. You can see that there are a lot of things going on. This version is also lacking the potential Sierra Barrier jet (Parish 1982 J. Appl. Met. Clim.) 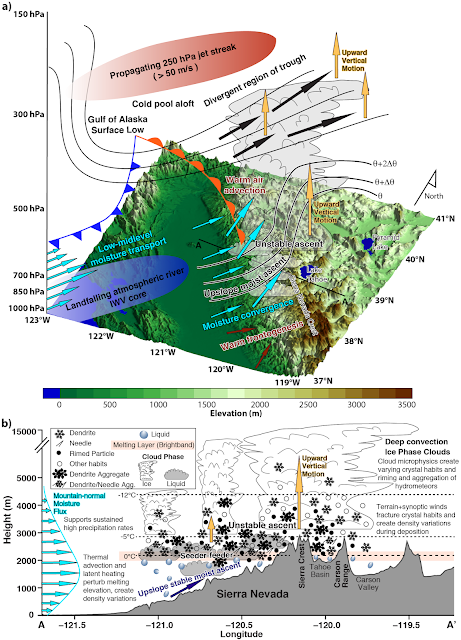 which strongly controls orographic precipitation gradients in the Sierra Nevada (Lundquist et al. 2010 J. Hydrometeor.) and is a key reason for the bullseye in precipitation that often is seen in Plumas County (e.g., Ralph et al. 2016 J. Hydrometeor.). If you are into snow science and look at crystals and snowpack stratigraphy, try to relate what you see to processes that produce those layers and crystal habits. 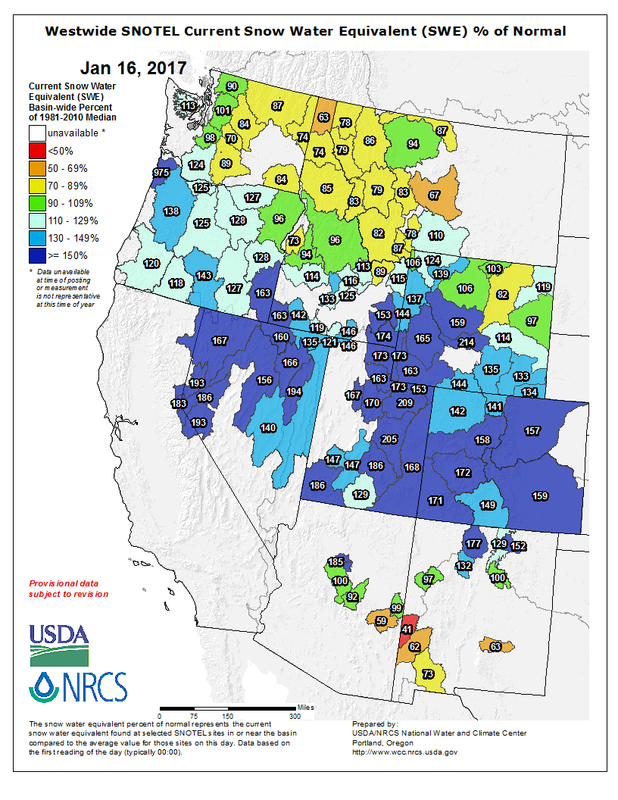 It will help you understand the snowpack and mountain weather that much better. Things look OK Saturday (above). It is Sunday where things get bad, and both the GFS and NAM agree on this. After a 12 hour period where several billion gallons of rain will fall, we will shift back into a cooler regime late Sunday evening/early Monday. Hopefully there will be some snow left! I spent the afternoon at Alpine Meadows today. The snow was fantastic and the lift lines were fantastically long. Upper mountain was shut down all day due to high winds, and that trend will likely continue through at least Thursday. About 8-10" fell overnight and snow continued throughout the day making for a good start to this exciting storm cycle coming up. The first wave is winding down and several more inches will fall at the resorts overnight. Not much break before the next wave arrives tomorrow afternoon. 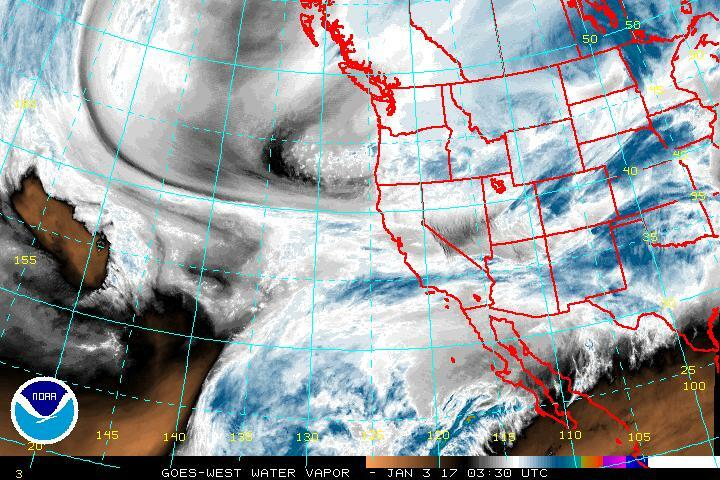 The water vapor satellite image below shows a classic setup for a good Sierra snowfall. We have a cold upper level low currently off the coast of Oregon that will merge with a good moisture tap that can be seen off the coast of central California. Tahoe resorts should see several feet of snow through Thursday Morning, with snow levels not being an issue with this storm. The 72 hour forecast from the GFS show impressive snowfall over much of the length of the Sierra. However, temperatures will get warmer with this next storm (as seen in the image below), and snow will contain more water (less fluffy powder). 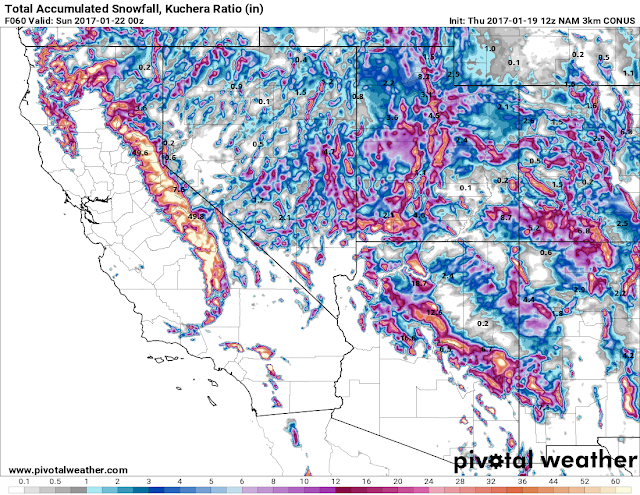 This is actually a good thing for our snowpack, but will make for some sketchy avalanche conditions. We should see a break in the action Thursday into Friday, but then things get really interesting as we go into the weekend. 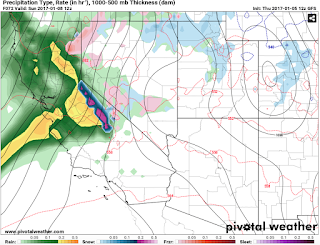 It is looking more likely that another atmospheric river will impact the region with significant precipitation through the weekend and maybe into next week. The big question right now is snow levels. There is a good chance snow levels will rise to lake level and maybe much higher. Details with these storms change rapidly so we will have better snowfall estimate later this week. The ensemble shown below, consisting of about 20 different forecast runs, shows a very consistent wet pattern ahead with 10-15"+ precipitin through the next 7 days with 80-100" of snow. This at Donner Summit. If it stays cold enough, these numbers could verify, but if it warms too much snowfall will be much less. Enjoy the snow this week and be safe out there. Avalanche danger will get progressively worse over the next several days, so use caution and have fun! Hey It's Sum...NOT SO FAST, MY FRIEND!